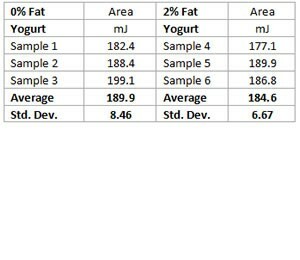 A processor of Greek yogurt was looking for a way to measure the difference between their 0% fat and 2% fat products. Current methods involve sensorial inspections which are very subjective. This processor did not have a way to objectivly measure the difference in texture between their products. It was important for them to know that the products’ textures were very similar, because from a customer stand-point, they do not want a customer to experience a drastic difference in texture between the 0% fat product and the 2% fat product. Testing was performed with a TMS-Pro Texture Analyzer, a 250N load cell and an FTC custom-made cylinder probe. The test performed was a back extrusion test. As such, the program was written to start at zero, run down at 100mm/min until it sensed the top of the yogurt, then run into the yogurt 20mm at 200mm/min, then return to zero. 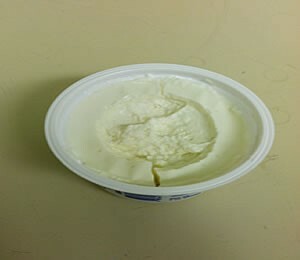 The individual cup of yogurt was placed on the standard fixture table so the cylinder probe ran down directly into the product. 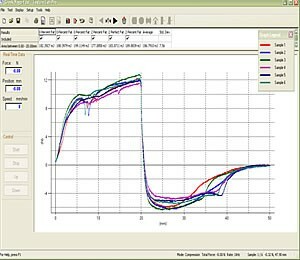 The graph to the right shows the curves generated from the test. The first curve is the cylinder probe entering the product. The negative force curves on the bottom show the cylinder retracting from the product and the stickiness on the return home. The test proved positive results for the processor, as there was not a significant difference detected between the textures of the two products.